If you donate enough money, they name a building after you: Facebook co-founder and CEO Mark Zuckerberg and his wife, Priscilla Chan, will donate $75 million to San Francisco General Hospital, the San Francisco Chronicle reported. 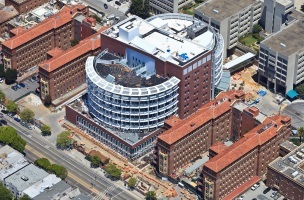 The donation is the largest since the creation of the San Francisco General Hospital Foundation in 1994, and it is believed to be the largest single private gift from individuals to a public hospital in U.S. history, the Chronicle reported, adding that the facility will be renamed the Priscilla and Mark Zuckerberg San Francisco General Hospital and Trauma Center. San Francisco General Hospital is currently the city’s only trauma center, according to the newspaper. According to the Chronicle, the hospital’s current structure was built in the 1970s, with some buildings dating back to 1915, and it does not meet current seismic standards. The newspaper added that the new hospital is being built on the existing site, and the bulk of the financing for the project is coming from a voter-approved $887.4 million bond measure, but that bond measure only covers construction. There will be no difference between what patients have available to them as far as equipment, furnishings and all of that at San Francisco General as compared to the other hospitals being built in San Francisco. Day in and day out, I witness the compassion and dedication of my colleagues as they work tirelessly to deliver the best available care to all of our patients. Mark and I are proud to support such an important public hospital. This precedent-setting grant is a key piece necessary to the completion and opening of the new building in December. It’s incredibly gracious that they have recognized the importance of this hospital to the entire city. They have made sure that in the future, there will be enough money to maintain and modernize it. They want a public hospital as important as this to be at world-class standards every year. Image courtesy of San Francisco General Hospital Foundation Facebook page.